2005 Dodge Cars - Section contains a collection of featured 2005 Dodge vehicles submitted by visitors of the My Dodge site. Own A 2005 Dodge? Show your Dodge pride by having your Mopar featured on the My Dodge site. We are always looking for Dodges to add to this section. 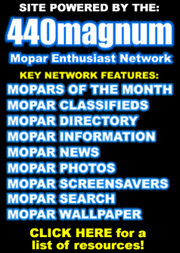 To get your 2005 Dodge added to the site please, click on the submit your Dodge link above. 2005 Dodge Magnum - The 2005 Dodge Magnum is a brand-new sports wagon that offers seating for five passengers, plenty of rear cargo space and an array of sporty engines to choose from. 2005 Dodge Neon - A compact sedan with seating for five, the 2005 Dodge Neon achieves well over 30 mpg in the more economical trims or it can achieve sporting fun in the SRT4 trim. 2005 Dodge Stratus Coupe - A mid-size two-door coupe, the 2005 Dodge Stratus Cpe is available with an automatic or manual transmission. 2005 Dodge Stratus Sedan - The 2005 Dodge Stratus Sdn is a mid-size five-passenger sedan offered with a base four-cylinder engine but it is also available with a more powerful six-cylinder. 2005 Dodge Viper - An exotic, high-performance two-door sports car with seating for two passengers, the 2005 Dodge Viper houses a massive 8.3L V10 which generates 500 hp.